Bundi District is a district of Rajasthan, which is a state in the western part of India. The district headquarters is the town of Bundi. 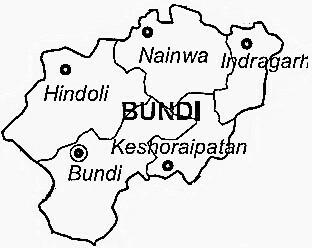 Bundi is divided into five tehsils, six towns, four panchayat samitis and around 890 villages. Bundi has been rightly termed as the queen of Hadoti.Bundi is very famous for its baoris meaning waterworks or step wells, havelis, temples and chhatris with carved pillars. The mural adorned palaces, the forts and the monuments tell tales about the glorious past of the city. The residents of Bundi are mostly Rajputs and are known for their bravery and heroism. Most of the aborigines of Bundi are old fashioned and follow the typical Rajasthani culture and rituals. Hindi and Rajasthani are the two major languages spoken here. Bundi sandstone is also a major foreign exchange earner. The district also plays hosts to cement, soya and edible oil industries. Nawal Sagar Lake, Step Wells, Talwas Fort, Taragarh Fort, Raniji ki Baori, Badal Mahal, Sukh Niwas Palaces, Bhoraji-ka-kund, Bijolia, Chaurasi Khambon ki Chhatri, Chhatra Mahal,Chirtashala,Garh Palace, Hathi Pol, Bundi Utsav. Bundi is located in South-eastern Rajasthan with Tonk in the North, Bhilwara in the West, Chittorgarh to its South-West and the Chambal flowing past its Eastern and Southern borders. Bundi district has very hot climate during summers and pleasant cold weather during winters with maximum temperature to 43 C and minimum to 5 C.
Nearest airport to Bundi is Sanganer Airport which is located at a distance of 215 km away at Jaipur. Bundi Railway Station is well connected to other major cities of the country with trains at regular interval of time. Bundi is well connected to other major cities of the state including Madhopur, Bikaner, Jaipur, Kota, Bijolia, Udaipur, Ajmer and Jodhpur by state run and private buses.